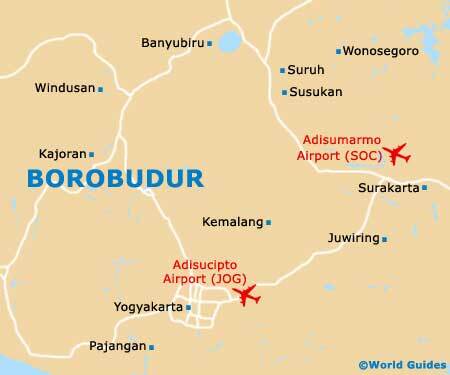 The hotels around the Borobudur region are at their busiest during the dry season (May to September), when they are also at their most expensive. Borobudur itself is a bustling Indonesian village, which owes its extreme popularity and tourist appeal to its beautiful temple. Although the village of Borobudur is really quite small, there is a very reasonable selection of accommodation to choose from. Popular choices include the Lotus II on the Jalan Balaputradewa, the Homestay Rajasa on the Jalan Badrawati, and the Lotus Guest House on the Jalan Medang Kamulan, directly to the north of the actual temple itself. Located along a peaceful lane on the easterly side of the Borobudur Temple, the Hotel Bhumisambhara is known for its tranquil situation and simple lodging. However, if money is not an issue, then the Manohara Hotel boasts a truly unbeatable situation, since it resides within the monument grounds. Standing high amidst the Menoreh Hills and enjoying truly stunning panoramas of the Borobudur Temple, the Amanjiwo is a majestic building and almost a tourist attraction in its own right, being sited some 3 km / 2 miles to the south. The luxury accommodation provided at the Amanjiwo comes in the form of exclusive suites with private swimming pools. Alternatively, look to the nearby highlands of Magelang for lodging. Magelang hotels are approximately 20 km / 12 miles to the north of the Borobudur Temple and don't come much better than the villa-style accommodation offered at the Losari Coffee Plantation, where verandahs overlook some impressive volcanoes.